1. The tape consists of a few layers, every layer has its function with its own specific rim side and tire side. 2. 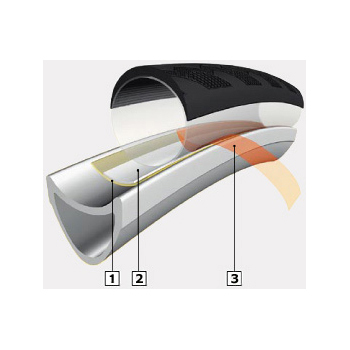 Active white strip on the tire side is absorbed into the tubular base tape resulting in a perfect tubular rim bond. 3. Due to the protective plastic film, the tubular is easily installed and centered on the rim. The film is pulled out from underneath the tubular after installation.